Submitted by Jules on Thu, 05/11/2009 - 13:35. Situated right on the sea front promenade in the centre of Playa Blanca, this restaurant is my very favourite. This restaurant used to be an old salt repository so has bags of character and charm. The service is second to none as is the cuisine. There is an extensive menu to choose from and I have many favourites on the menu including the onion soup, avocado with prawns, steak, fresh fish, paella, to name but a few. This restaurant also has live piano music and is very child friendly yet also romantic. Situated on the sea front promenade towards the harbour. Don Camillo offers excellent international cuisine with an extensive menu. There are three different kitchens, including a steak grill and pizzeria. The T-bone steak is wonderful but don’t order it unless you haven’t eaten for a while! Submitted by Jules on Fri, 23/10/2009 - 08:18. The popular department store El Corte Inglés has launched a competition to find the best tortilla to mark their anniversary. The competition is open to amateur and professional chefs and the prize is €300 to spend in the store. Submitted by Jules on Sat, 27/06/2009 - 10:53. Submitted by Miguel on Fri, 26/06/2009 - 08:43. As requested by Gwen from Florida, here is the paella recipe that we use in Lanzarote. These quantities are sufficient to serve 10 people (50cm paella pan) so half the ingredients if you are making this at home for the family, typically we make it at the weekends when we have friends over. Submitted by Jules on Thu, 18/06/2009 - 15:25. 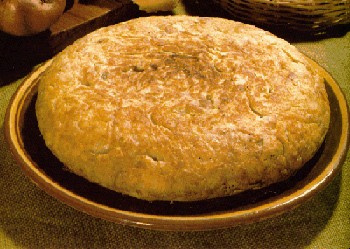 Here is the recipe for making a Spanish tortilla (potatoe omelette), this is great to serve up as a tapas dish or as an accompaniment to meat / fish or just in a bocadillo with mayonnaise or alioli. Submitted by Jules on Mon, 08/06/2009 - 16:46. Submitted by Miguel on Thu, 28/05/2009 - 10:22. Submitted by Miguel on Mon, 11/05/2009 - 15:43. This is a fabulous bar restaurant that you could easily miss in Costa Teguise. The best way to get to it is along the sea front promenade – it’s situated just before Playa Bastian when you’re coming from the main town.